Combining the complementary exercises of yoga and kayak paddling creates a balance between land and water. Renowned instructor, Lauri Nemetz, is a pioneer of this integration. 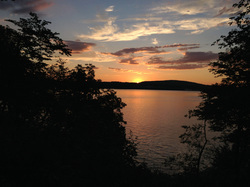 There are various destinations including sunset tours (in Cold Spring and Peekskill), World's End, Fort Montgomery (Peekskill schedule), Constitution Marsh, and more. Click on each date on our schedule page under the "Home" tab to see the location for each date. Please check with Cold Spring Yoga and Pilates for their season opening date. Register through ​Cold Spring Yoga and Pilates for yoga on the Hudson River. Paddle Yogis launch from Foundry Dock Park and practice in Foundry Cove. The use of the board in the water adds a whole new element of core strength, intense focus and single-pointed concentration taking the practice to an entirely new level. Add to that the fresh air, water, and nature all around you for an amazing experience. An exclusive chance to spend a night on Pollepel Island, located between the sentinels of the Hudson Highlands, Breakneck Ridge, and Storm King. With few camping choices on the river, spending a night on an historic island is truly a select opportunity. A member of the Bannerman Island Trust will accompany the group to offer historical reference. A special yoga/kayak combination with Lauri Nemetz increases this already invaluable experience. This tour is also available as a private event for a minimum number of participants, contact us.